Last year’s Winner of the HFF17 Best Comedy Award, “Easy Targets,” brought to the Hollywood Fringe Festival by members of the Burglars of Hamm–at the then-Sacred Fools Theater, now The Broadwater–gave a gave deal of relief, albeit only temporarily, in the politically charged atmosphere that was our dumpster fire of the post-election of 45. But this year’s, “Easy Targets, Artists and Heroes” at The Broadwater, sold out for preview on Saturday, June 2, 2018, appears to be responding to the resulting political and daily breaking-news-burnout we’ve been experiencing, and instead looks more inward. That’s not to say that this year’s “Easy Targets, Artists and Heroes,” tightly directed by Jaime Robledo, is avoiding politically charged material–not at all! But the four vignettes that culminate “Easy Targets” still do endeavor to provide cathartic relief, as always, and yet also still shine a tight spotlight on some of the bad, stupid, and just plain ugly that spews from the narcissistic, self-obsessed, clueless, and/or ignorant, that walk among us. Audience members are provided with clean, balled-up socks and are encouraged to pelt the characters, whenever frustrated or inspired. The four vignettes, “All About Me,” Written by Jon Beauregard, “An Evening With Abraham Lincoln,” Written by Matt Almos, “Word Magic,” Written by Selina Merrill, and “Space Man (or How I Found Myself In Low Earth Orbit),” Written by Robledo, lend plenty of inspiration to that effect. 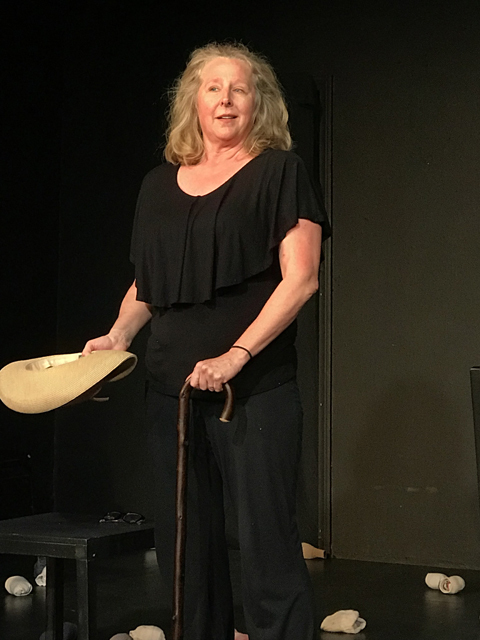 Selina Merrill in “All About Me” from Easy Targets: Artists and Heroes, at the Broadwater Theatre at the Hollywood Fringe Festival 2018. 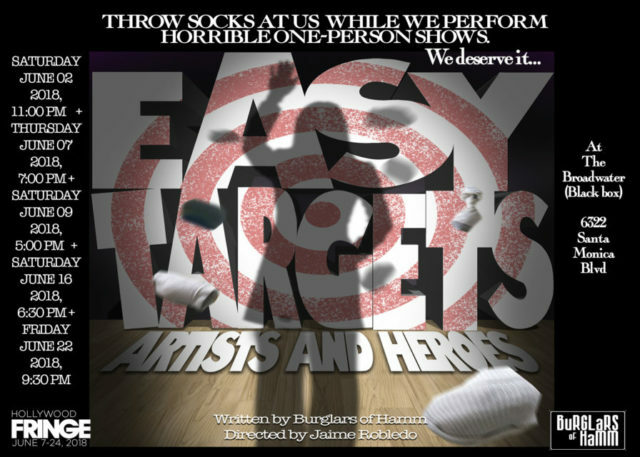 A new addition to this year’s Easy Targets is an on-stage presence of sock wranglers and audience members eager to provide very specific target sock-pelting. The melee that ensues is always fun to watch, but is even better to participate in. And perhaps better still than watching drunk-yet-adroit actors do Improv. But improv this is not. Easy Targets’ well-crafted writing and well-timed delivery and pausing make for perfect target practice, while perhaps even giving a start to some self-introspection. The “targets” are a narcissistic, self-important actor-type, a “woke AF” warrior/self-indulgent Social Media Activist-type, a scenery-chewing actor-type oddly interpreting a historical President, and a clueless-ridiculous “Major Tom” space cadet who breaks out into well-trodden poetic soliloquy within the throws of the Five Stages. Racism, sexism, and other isms are touched on as well. Actress, Merrill, in “All About Me,” brings a spot-on performance as a self-important actor-type, whose vignette takes pot shots not only at the character, but also at various acting methods, processes, and the not-so-unique art of plain clueless-bad acting. A great deal of the actors in the audience rather enjoyed this; in-jokes, perhaps, but any and all who love and attend theatre will certainly appreciate. 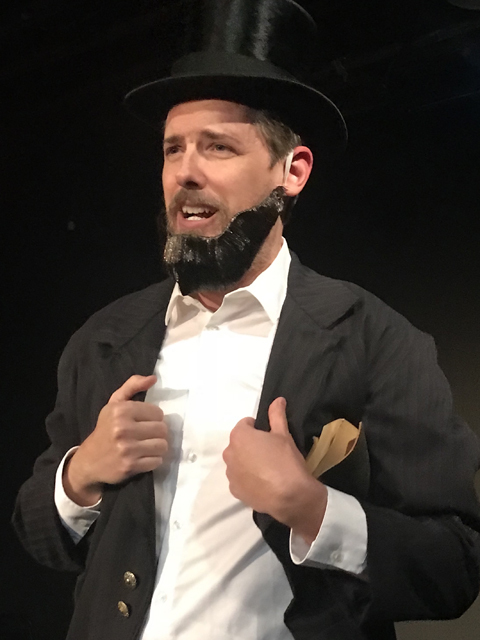 Eric Curtis Johnson in “An Evening With Abraham Lincoln” from “Easy Targets: Artists and Heroes” at The Broadwater, home of the Sacred Fools Theater Company, at the Hollywood Fringe Festival 2018. Eric Curtis Johnson in “An Evening With Abraham Lincoln,” whose 16th President “character actor” chews-up some equal scenery with stereotypical Stove-Pipe and bad facial hair, provided him the best of business and inviting target practice. Tracey Leigh in “Word Magic” uses her character to take digs into activist-types who troll the Twitter-sphere, and internet chats, who may or may not be more in it for the personal exposure than for the actual cause. Her character doubles, with misguided wisdom–or wisdom-less–as an inspirational speaker who, coincidentally, also voted for Stein. Some bad beat-generation-coffee-house-style musical accompaniment to her, um, poetry, gives the audience an eager rise to their pitching arms. 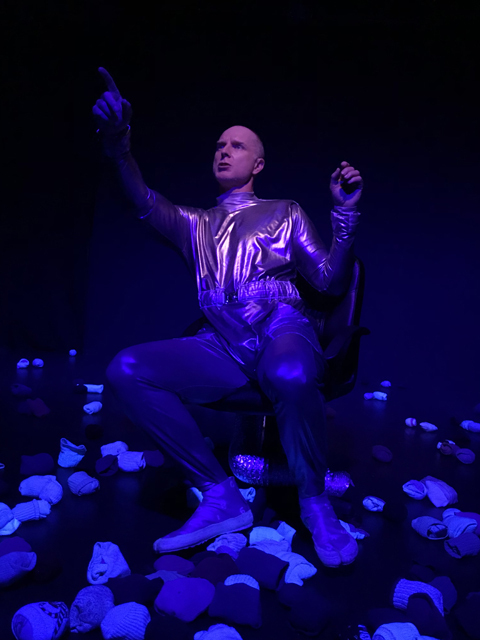 Coming back this year is multi-Ovation Award nominee Hugo Armstrong in “Space Man (or How I Found Myself In Low Earth Orbit),” whose character also sported some inviting costume-aided target-practice, delivering a bathroom joke and, dare I say it–business–that is only as foul as your imagination can lend, which can be pretty foul. But Armstrong’s Major Tom-type stepped up and into the line of fire best launching into “Do Not Go Gentle Into That Good Night” within his fourth stage and chewing up the galaxy with it, only to confuse his quoted poet. Producer Scott Golden warms up the audience by personally providing target practice between each skit while the sock wrangling commences. In the end, it was just nice to see this creative team roast the acting and theatre community-at-large a bit. Not only is this year’s group of talented Easy Target actors brilliant at being “bad,” they’ve well-earned a new kind of badge that perhaps only improv or stand-up vets, who’ve mastered both craft and hecklers, might exceed–tank-tough focus–making this piece arguably the best item on their resume. Overall, for you as a participating audience, the experience is incredibly fun and very cathartic, especially where de-stressing might be a goal after a hard day, week–or year! Run, don’t walk, and/or, for every reason, take a Lyft or theater tour, as well. Have a pre-show cocktail nearby perhaps if you need to reduce the inhibition and worry that you’ll hurt the actors–because you can’t–but do perhaps be sure to limber up and do some pre-game arm stretching just before you go! Visit Easy Targets for tickets or purchase at the door at The Broadwater (Black Box) door at 6322 Santa Monica Blvd., Hollywood on Theatre Row. Tickets are $12 and additional socks can be rented. Easy Targets opens Thursday, June 7, at 7 p.m., with additional shows on Saturday, June 9, at 5 p.m., Saturday, June 16, at 6:30 p.m. and Friday, June 22, 2018, at 9:30 p.m. For more information visit http://www.hollywoodfringe.org/projects/5087. This entry was posted in Events, Theater and tagged Artists and Heroes, Easy Targets, Eric Curtis Johnson, HFF18, Hollywood Fringe Festival, Hugo Armstrong, Jaime Robledo, Jon Beauregard, LAthtr, Matt Almos, Scott Golden, Selina Merrill, The Broadwater, The Broadwater Plunge, The Burglars of Hamm, theater planners tours, Tracey Leigh. Bookmark the permalink.